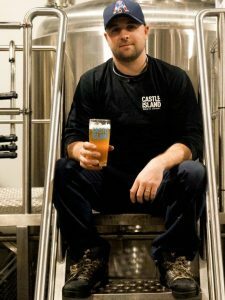 Norwood, MA – Castle Island Brewing Company is ringing in the new year with the announcement of its newest beer, and an updated look for one of its first beers. Mo’ Pils, a pilsner brewed with Mosaic hops, is the Norwood-based brewery’s latest creation, and its fourth beer in the Company’s seasonal lineup. Described on the label as “crisp and crushable”, the beer clocks in at a sessionable 4.7% alcohol by volume, and features “fruity, floral, funky” Mosaic hops. Mo’ Pils is also Castle Island’s first lager. As craft lagers have become more prevalent in the marketplace, breweries have started giving the often overlooked category another shot. But lagers take twice as long to produce due to extended cold-conditioning, which can create a bottleneck in production. Mo’ Pils will be available in four-packs of 16 ounce cans and on draft beginning in mid-February. Matt DeLuca, Head Brewer at Castle Island, checks the progress of Mo’ Pils as it conditions in the tank. The beer will hit shelves throughout Eastern Massachusetts in mid-February. 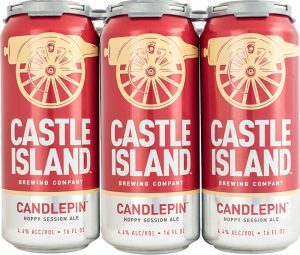 Several weeks before Mo’ Pils hits shelves, Candlepin, Castle Island’s flagship hoppy session ale, will get a new look, as the brewery upgrades the current four-pack format to six-packs of 16 ounce cans. “This is about giving the people what they want: more great beer at a price that won’t break the bank. This is what we’ve always done and will continue to do,” added Romanow. Candlepin six-packs will begin shipping to retailers on January 23rd. And while consumers are now getting fifty percent more beer in every pack, they won’t be paying fifty percent more. The Company has set a suggested retail price of $11.99, a $1.00 bump from the current suggested four-pack pricing. Six packs of Candlepin, the brewery’s flagship session ale, will hit shelves beginning January 23. Located off Route 1, at 31 Astor Ave. in Norwood, Mass., Castle Island is currently operating on limited visiting hours. The brewery is open to the public on Tuesdays and Wednesday from 12:00 P.M. to 6:00 P.M., and Thursdays through Saturdays from 12:00 P.M. to 8:00 P.M.
For additional information about the brewery and for an updated list of retail locations where Castle Island beers can be found, please visit the company’s website (castleislandbeer.com) and Facebook page (facebook.com/castleislandbeer).